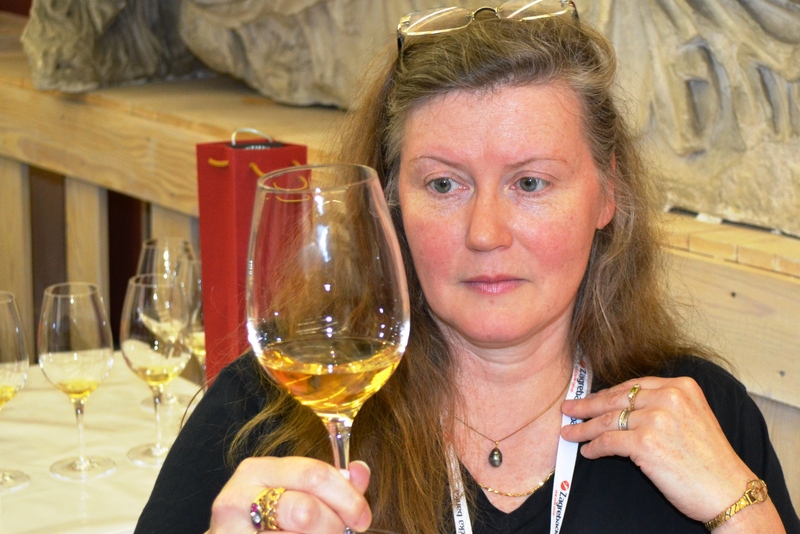 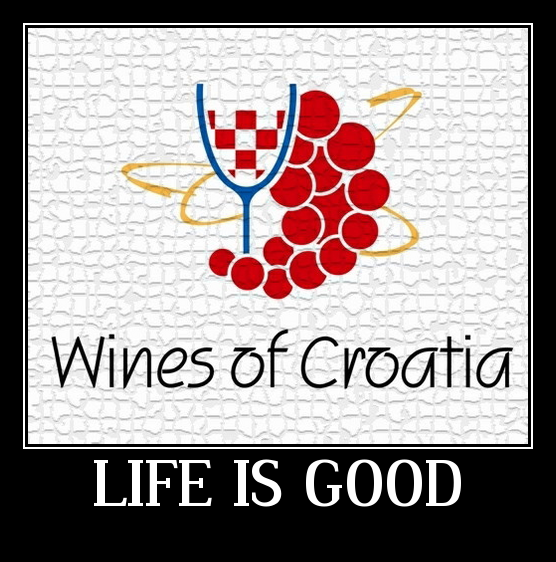 If you were unable to attend Croatia’s 2016 Dalmacija Wine Expo in April, don’t dismay (but start making plans for next year!) 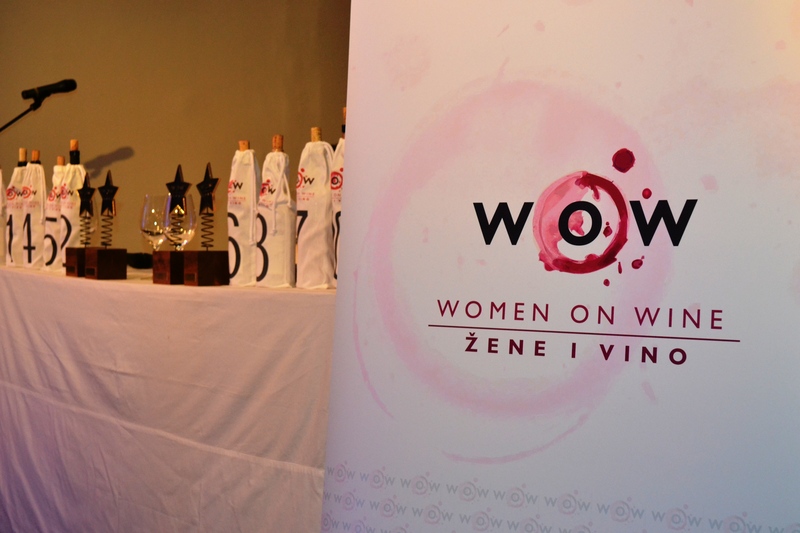 and instead check out these exclusive photos for an insider’s look at the festivities. 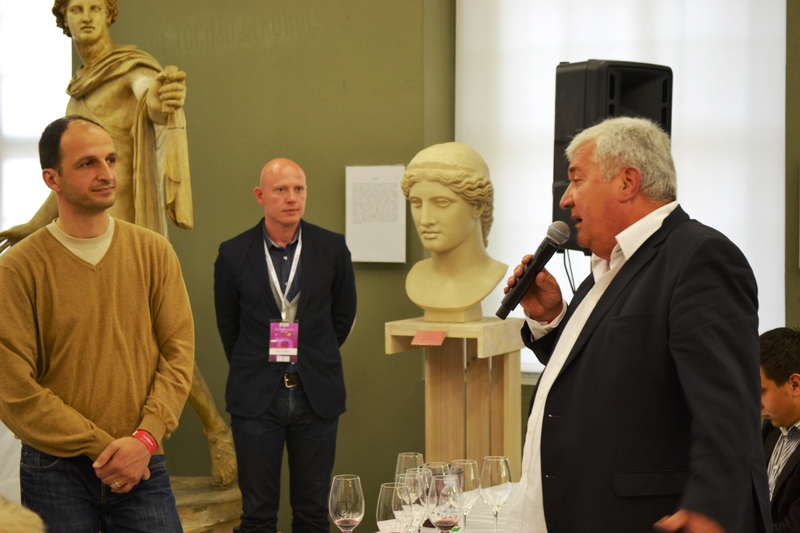 For a full report of the event and more photos, check out our recent post by Cliff Rames: “Dalmatia Wine Expo 2016: Three Things I Learned” . 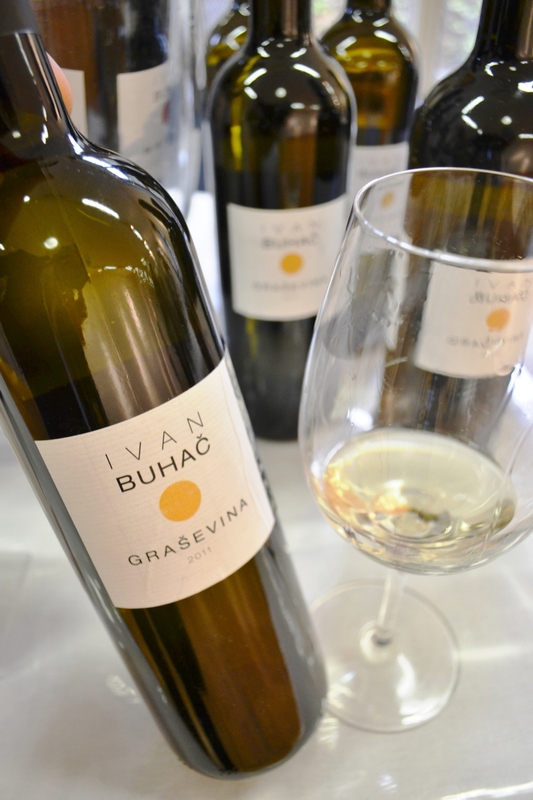 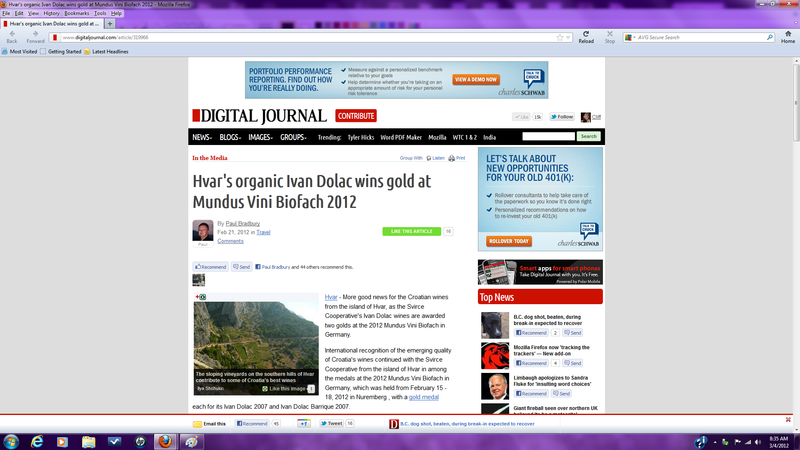 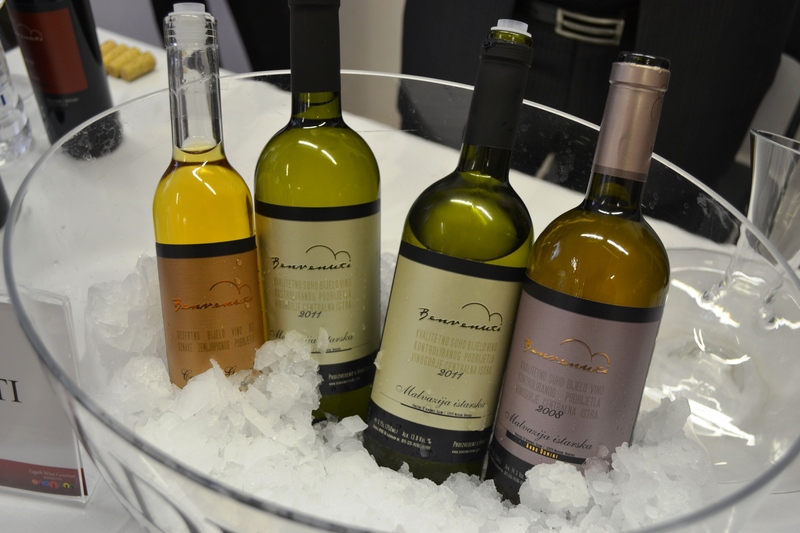 More good news for the Croatian wines from the island of Hvar: Svirče Cooperative’s Ivan Dolac wines are awarded two gold medals at the 2012 Mundus Vini Biofach in Germany. 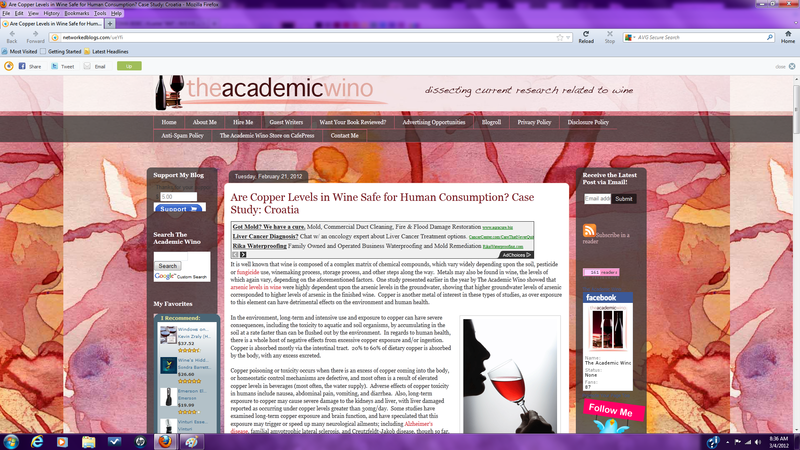 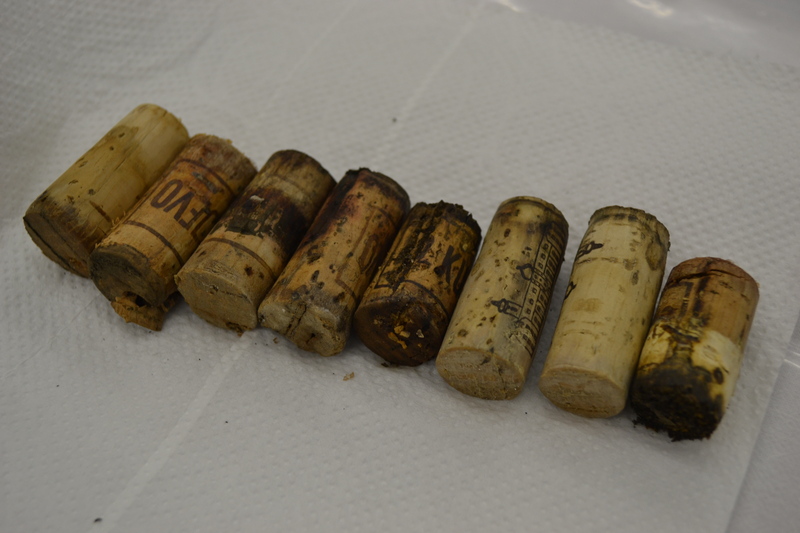 An assessment on the safety for human consumption of copper levels in Croatian wines. 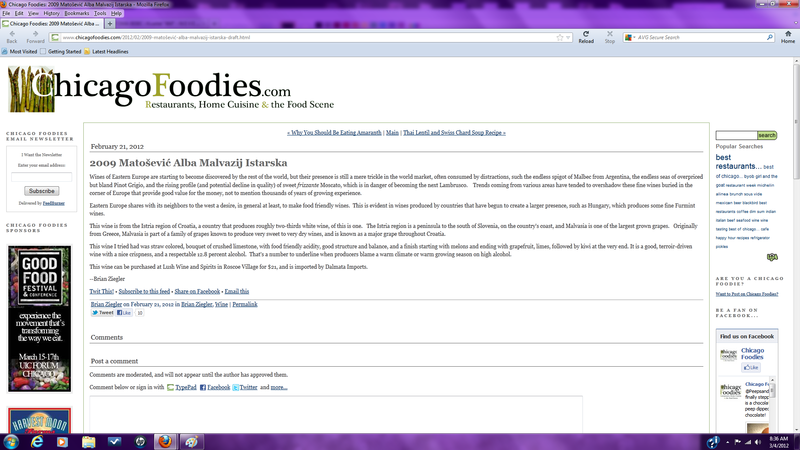 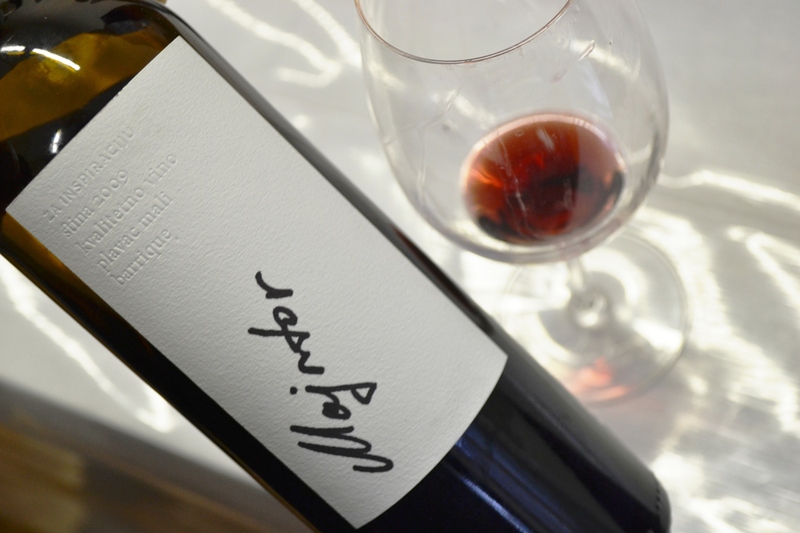 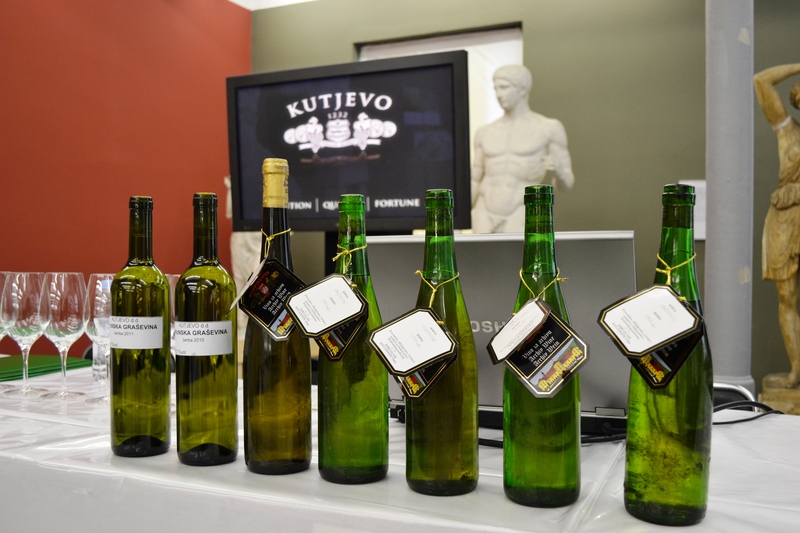 Chicago Foodies discover a “good, terroir-driven wine with a nice crispness and a respectable 12.8 percent alcohol” from Croatia in the Matoševic Alba Malvasia. 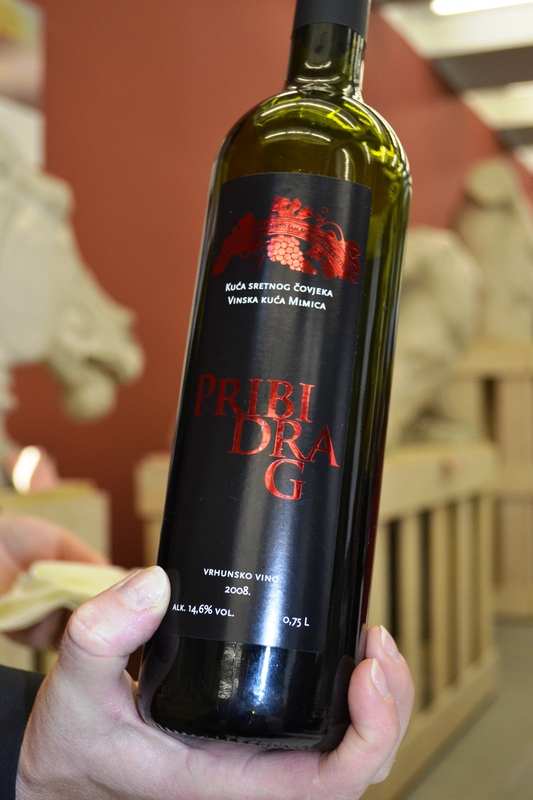 A nicely produced video about Istria by Freberg Production of Stockholm (mostly in Swedish but some English and Croatian). 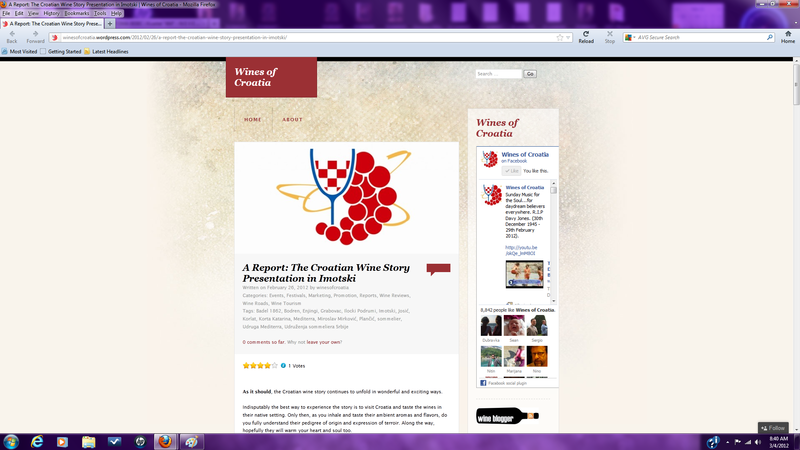 At the 4:12 mark there is a short profile of Kabola winery. 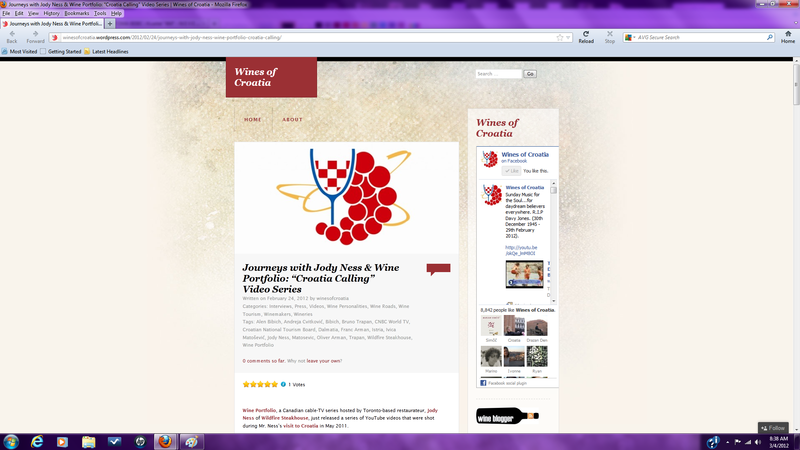 A compilation of all five videos in the newly released “Croatia Calling” series by Wine Portfolio. 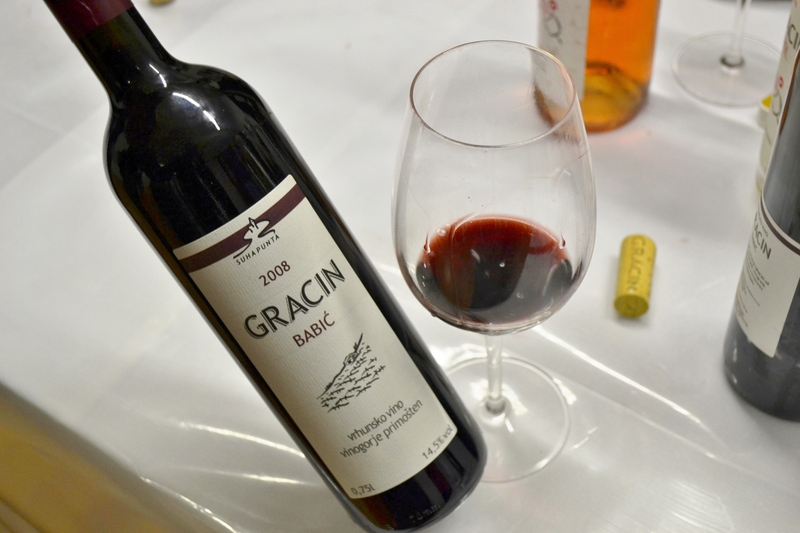 The Taste of Croatia crew brave the ice and snow at Bodren Winery in Zagorje to find out what it takes to harvest grapes for luscious Ice Wine. 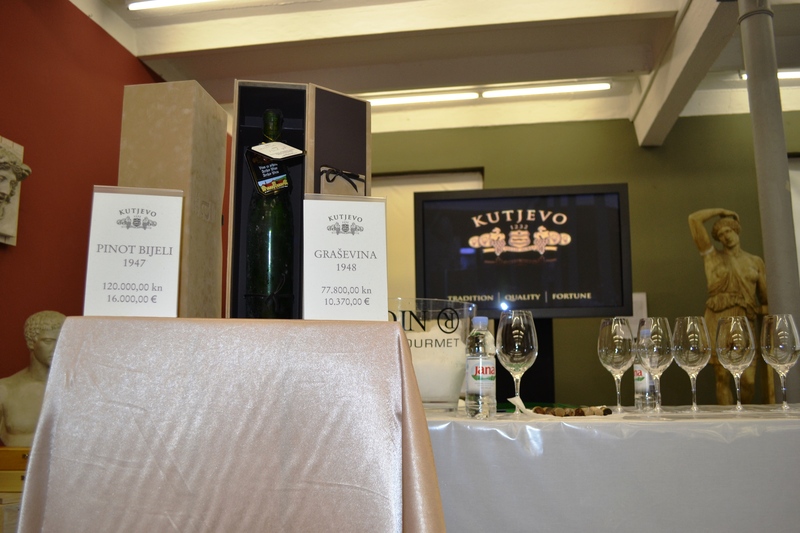 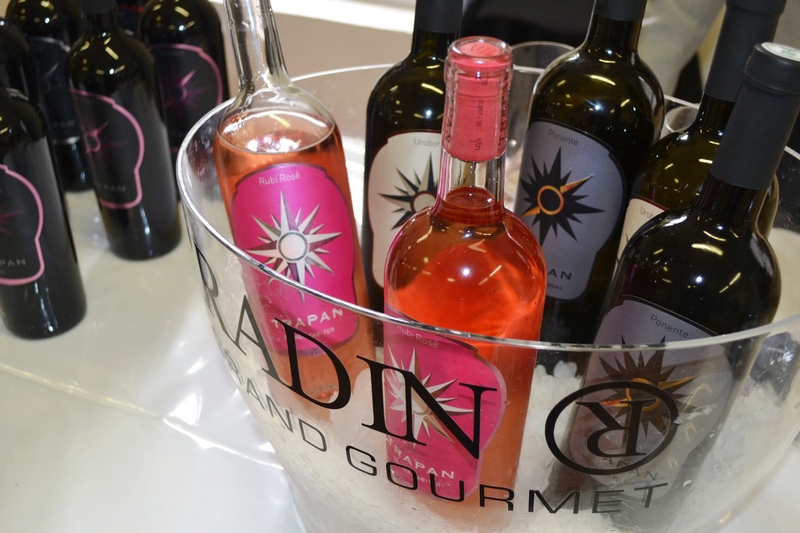 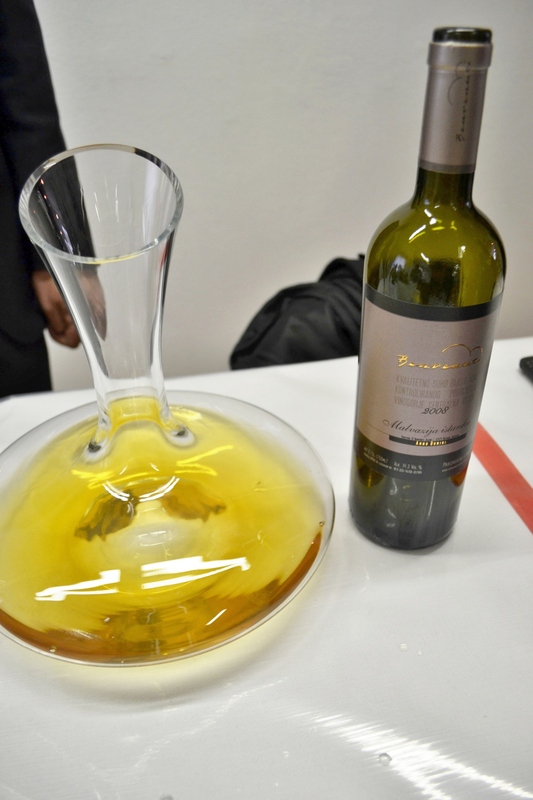 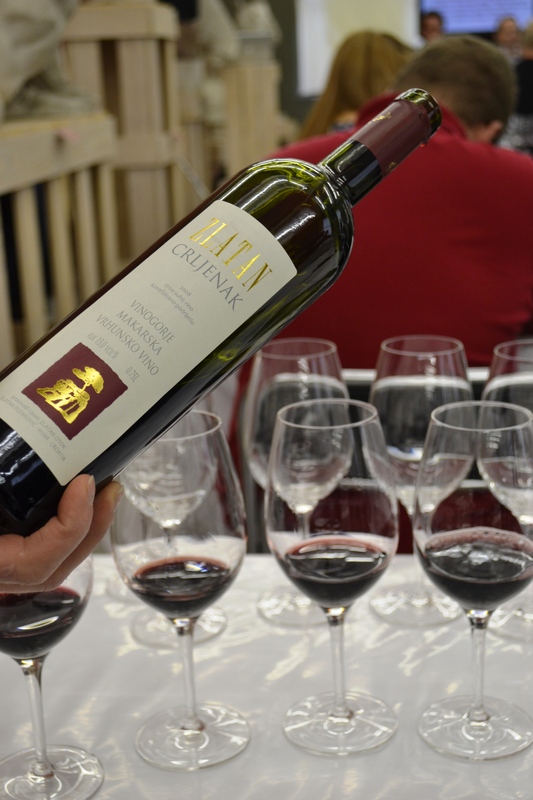 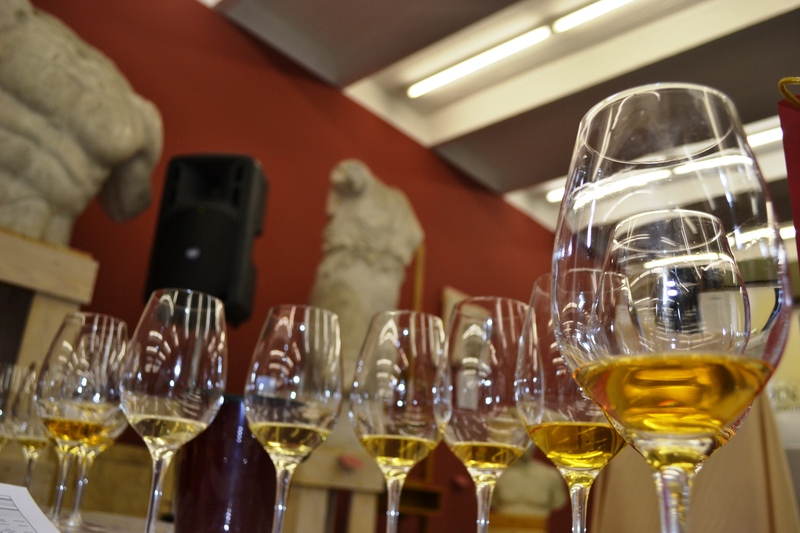 Find out which wines were the winners at the February 17, 2012 Croatian Wine Story festival in Imotski, Croatia – hosted by Udruga Mediterra and Grabovac Winery. 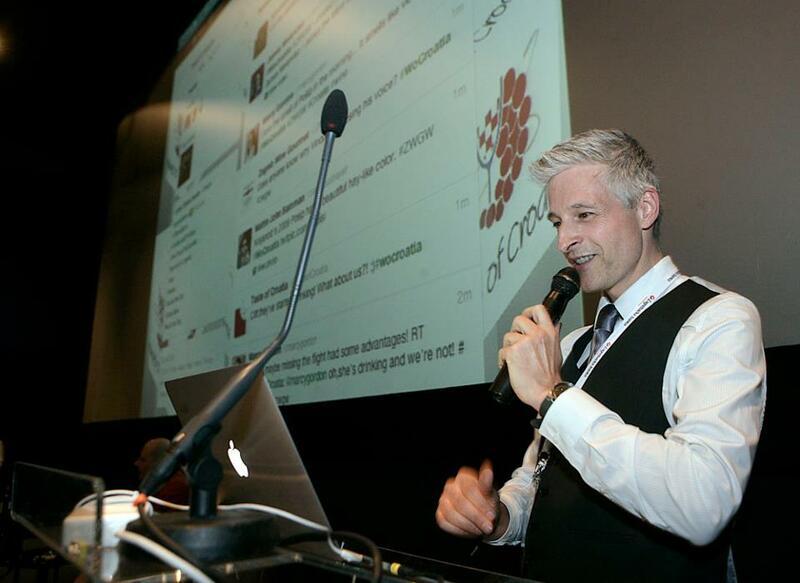 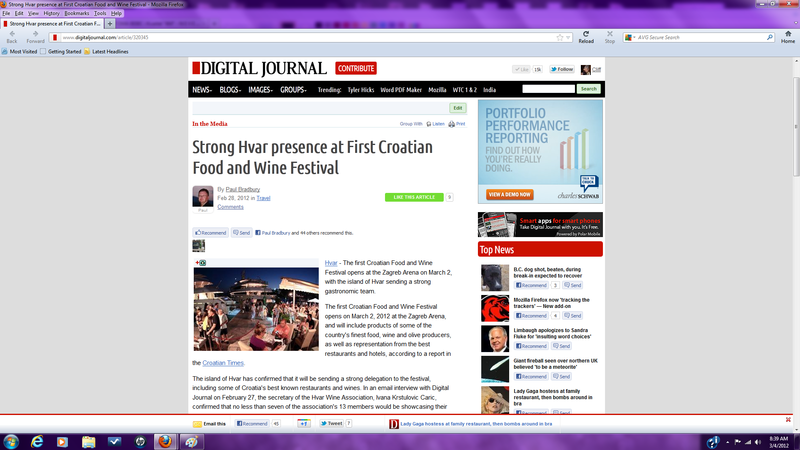 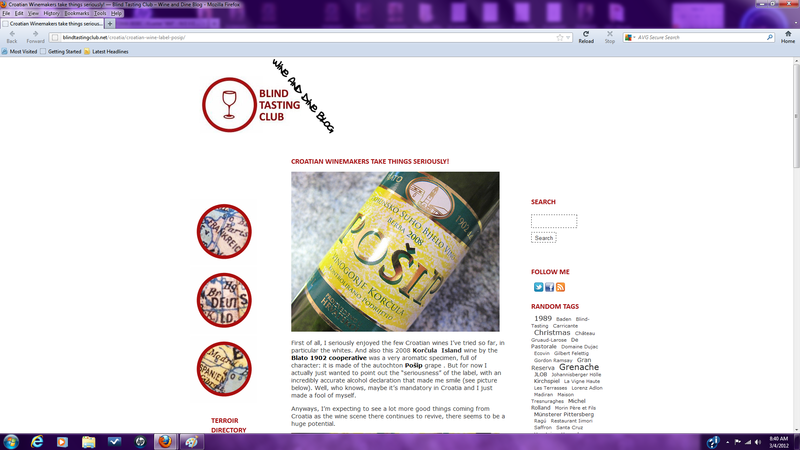 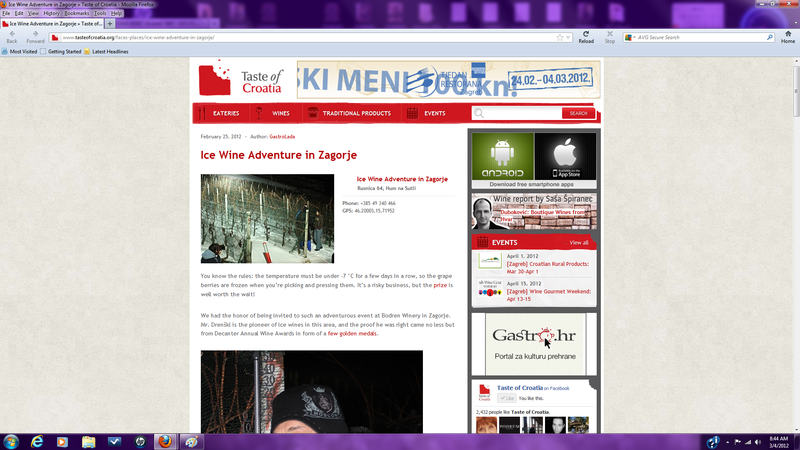 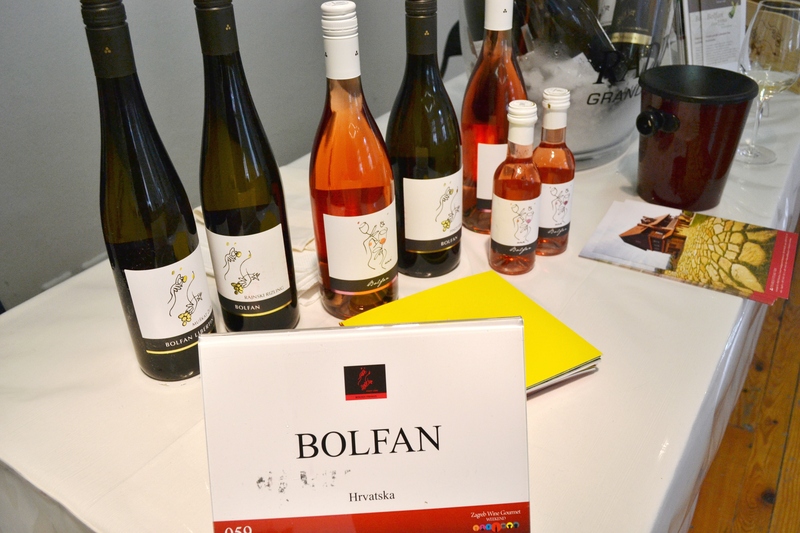 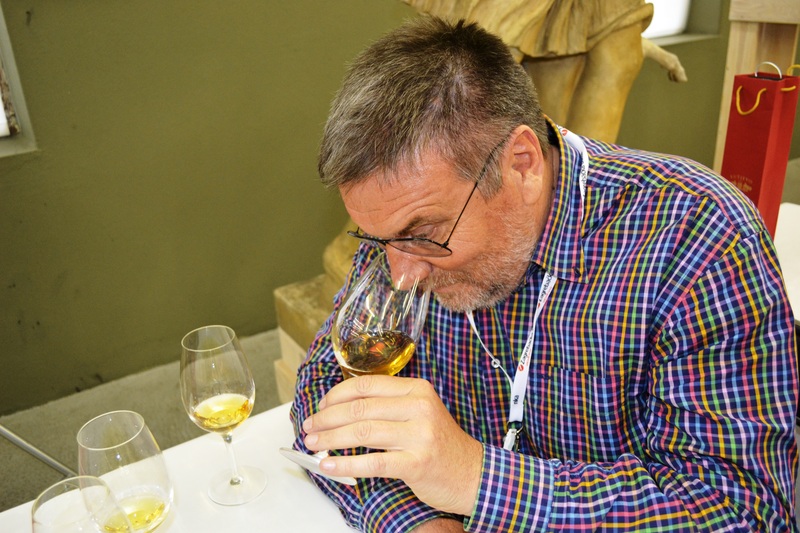 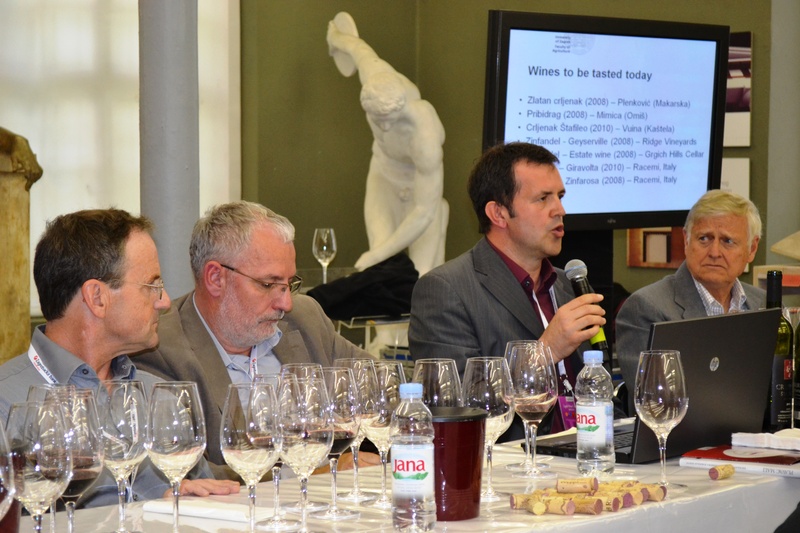 A report by Paul Bradbury from the Hvar Wine Association stand at the first Croatian Food and Wine Festival in Zagreb. 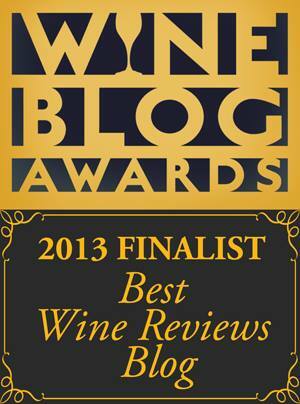 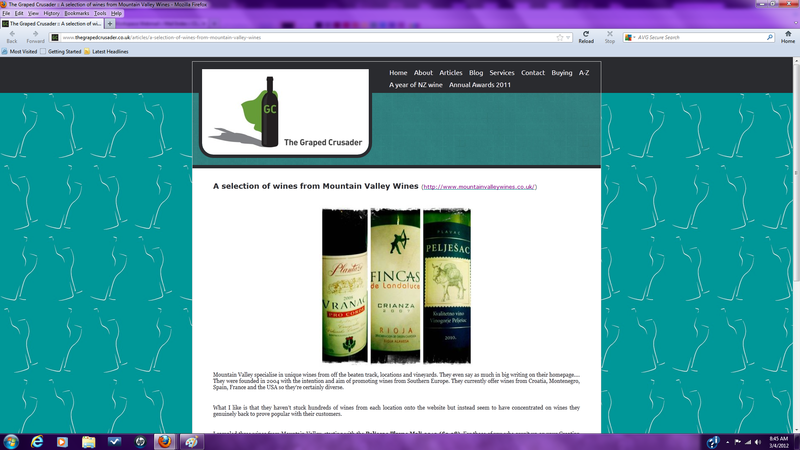 A review of three wines from the UK’s Mountain Valley Wines, including the Pelješac Plavac Mali 2010. 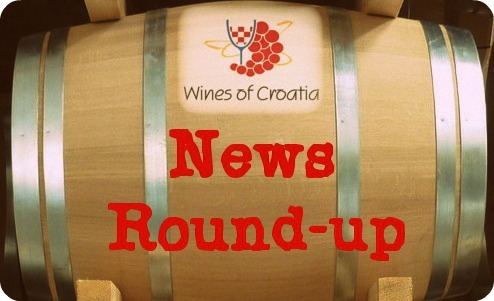 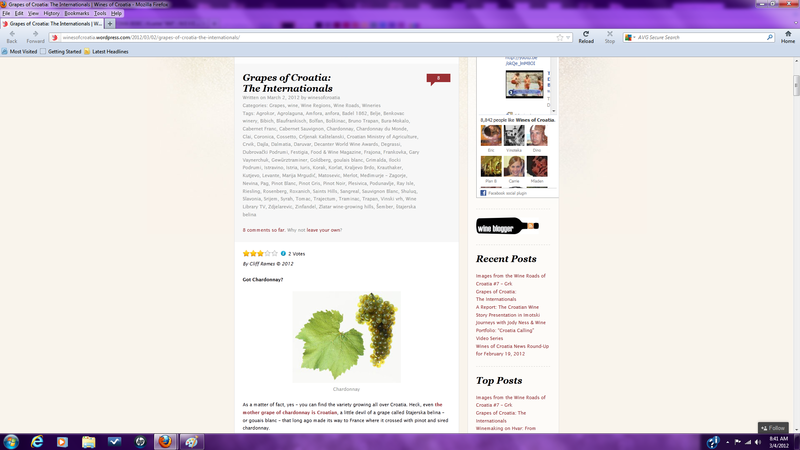 The first part in a new and ongoing series of posts called the “Grapes of Croatia”.